Inside: Discover why you need an emergency fund and how much you need. He then pointed at the front end of my car at what I hadn’t noticed. Somebody had backed into my front end, smashing the headlamp and scratching up the bumper. The scratches weren’t so bad. The car was already about 16 years old and, while we tried to keep it in pretty good condition, years of parking garages had taken their toll. But the headlamp. It wasn’t enough to bother calling the insurance company as replacing it would cost less than our deductible. But it was a couple hundred dollars that weren’t planned for. Where should you keep the emergency fund? Without money set aside for emergencies, taking care of life’s little (or big) surprises can be a lot more stressful. So what is an emergency fund? An emergency fund is savings set aside to help you weather the storm of unplanned events. This means you won’t have to rely on credit cards or rack up debt with a loan in order to take care of most emergency situations. How stressed would you be to have to pay for some of the emergency expenses mentioned? If you have no emergency fund or a very small one, you’ll probably be very stressed. But if you have a good fund set aside? It’s a bother, but you know you can cover the bill with a whole lot less stress. 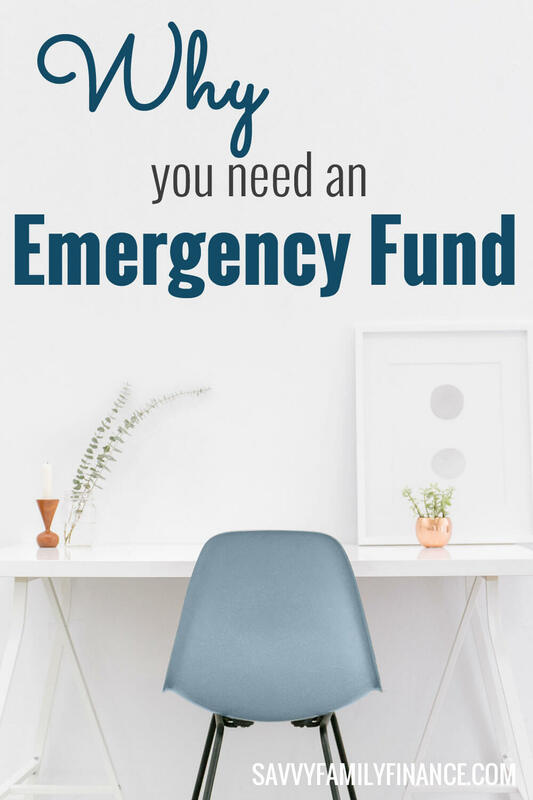 What types of things are an emergency fund for? You know that late-night craving you have for the egg-potato-asparagus pizza the new restaurant will deliver straight to the door? Yeah, that is not an emergency. Neither is that nice cocktail dress that would be just perfect for the company holiday party. As you can see, these are unexpected, unplanned expenses that really can’t be budgeted for other than saving money in an emergency savings fund. An online bank is a great place to create an account for emergency savings. Just don’t carry the ATM card in your wallet. You want your emergency savings to be liquid (easily accessible as cash), but not so easily accessible you are using it to buy pizza Friday night. That also means don’t rely on your retirement account as an emergency savings fund. That is not what it is for. Conventional wisdom is to save 3-6 months worth of essential living expenses. That means you look at your budget and you cut it to the bone. What would you need to get by for 3-6 months without eating out or buying new clothes, but still paying your rent/ mortgage and keeping the lights on? That is your savings goal. If you don’t have anything saved up, start with a smaller goal and work from there. Coming from the high-tech world and some nasty recessions, our family aims more for 6+ months of savings. If you work in a field and location where jobs are less prone to layoffs and work is plenty, then perhaps you can safely set a goal closer to the 3 month mark. So why do you need an emergency fund? Life happens. Thankfully, at the time our headlamp was smashed, we had enough set aside to cover the replacement. We were able to have the damage repaired and went on with our life. What unexpected events have thrown you for a loop? Were you prepared?